This Electronic Locking fire resistant filing cabinet protects important paper documents for up to an hour. The Burton Fire File 1 Drawer Fire Filing Cabinet has 1 heavy duty drawer suitable for both A4 and Foolscap files. Independently tested by ECBS to EN15659 LFS60P to offer 60 minutes certified fire protection for paper documents of temperatures up to 900 degrees. 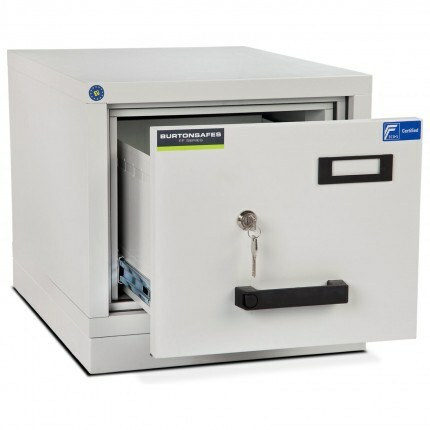 This Fire Filing cabinet comes supplied with high-security Electronic locking as standard. Each drawer can hold up to 40 KG of weight with Individual door latches which allow you to choose which drawers are locked centrally. Label holders on individual drawers to identify the contents of the filing cabinet. This Burton Fire File 1 drawer electronic locking fire resistant filing cabinet; comes complete with 60 minutes fire protection. This 1 drawer fire filing cabinet by Burton Safes has been independently fire tested at 900 degrees Celsius. 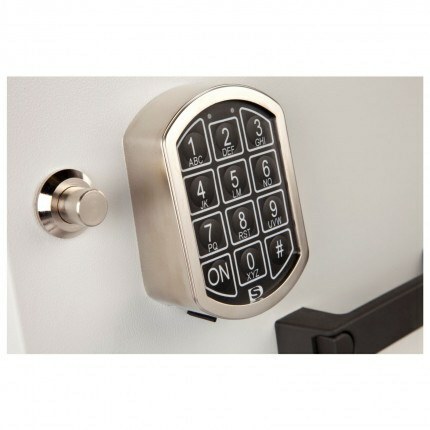 There are individual door latches which allow you to choose which drawers are locked centrally. 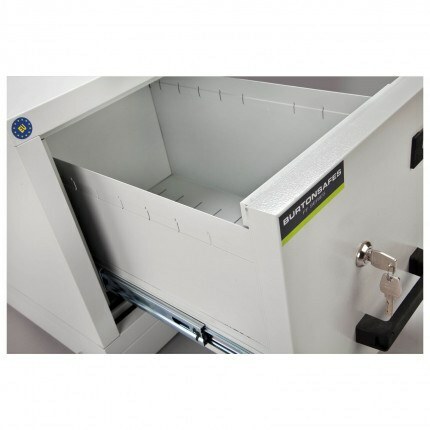 Therefore some drawers can be left unlocked for general use and others kept locked all day for more confidential use. What Protection do Fire Document Cabinets offer? If our Buyers Guides have not been able to help you or if you have any general inquiries please feel free to use our contact us page, or call on 0800 567 7549. Bronze Rated cabinets and safes are entry level lower security that offer resistance to opportunistic theft and will sometimes have an independent security test certificate, but if not, the manufacturer will have performed an in house evaluation. 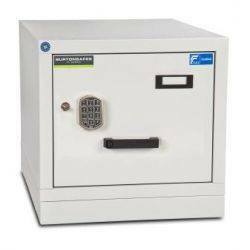 This fire resistant safe or cabinet has been tested and been issued with a fire certificate by a recognised international testing authority to provide 30 minutes fire resistance for paper documents. Some models will also protect digital or tape computer media for up to 30 minutes in a fire.